The Balanced Boater: QSKC Big Weekend. 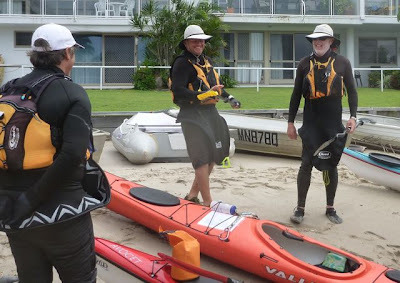 Last Friday night members of the Queensland Sea Kayak Club were out in force to hear what three of their most adventurous members had been up to out on the Capricorn Cays. This trip has caused a buzz of interest along the east coast; especially North of the border where there is a sense of excitement that a trail through the offshore cays has been forged and pride that local QSKC kayakers made it first. I suspect google earth has received a hammering from many of the eighty plus members and guests who crammed into the beautiful old Yacht club in Brisbane and were inspired by the Capricorn Cays story. It may very well be that even as I write this report cyberspace is buzzing with virtual trips as many ask themselves whether they might have a crack at this logistically convenient but challenging voyage that has been waiting so many years to be paddled. It was a really upbeat and positive night and I was honored to be invited to introduce the boys and speak about the significance of the trip. From their presentation we learned how team work and cohesion helped them through their toughest day on the water and it was a relief to see the contrast of paradise juxtaposed with the hardship of getting there. There were images contributed by all three paddlers with photos, chart extracts and GPS tracks arranged so we could match the images with their location and chronology. The teamwork that had served them so well on the trip was in evidence throughout the show with the guys working together to convey to the audience just what it was like to kayak out among the cays. I was especially impressed by some of Eddies beautifully composed seascapes and the groups underwater wildlife images. Commodore Graham (aqua) Dredge and his team of volunteers are to be commended on a great night. There was strong sense of community in the waterfront clubhouse making it feel very cosy despite the wind flogging the rigging of nearby yachts, and rain lashing the weatherboards. As I looked around the room I realised how many of these people I had paddled or trained with over the last few years and knew I was among friends. So I settled in, enjoying the good vibe, trying not to think about how I would manage the training scheduled for next morning. The following day didn't really dawn at all. The cloud hung low maintaining a deluge over Gary's place on the ''Sunshine Coast'' and the sky stayed a dull predawn colour until just before we packed the car and headed for Mooloolaba Beach. With a Gale forecast and the closest coastal observations at Cape Moreton already recording mid thirty to low forty knot gusts we opted for a morning of stroke blending and balance skills on the coffee coloured canals of the Mooloola River. As we lined up to launch I was pleased to see the vast majority were skeg boats well suited to some of the tight turns and other tricks we were going to try. The plan had been to use the sheltered corner of the ocean beach to start the day then work out into more exposed conditions just before lunch, but the wind kept us inside the river all morning. Fortunately I had designed a plan B program with Gary late the night before and this kept us busy until lunch. In the afternoon the group composition changed a little with some of the morning group retiring to warmer places and some new recruits joining us for a session on mentoring skills aimed at guides and leaders. Peer review and role play exercises raised some interesting questions and a few laughs. Throughout the day I was impressed with how receptive paddlers were to new approaches and different techniques. I think local instructors and senior club members should be pleased with the way their next wave of adventurous kayakers are developing, it is a credit to all involved. The QSKC is a relatively young club but they are definitely coming of age as the skill base continues to deepen. 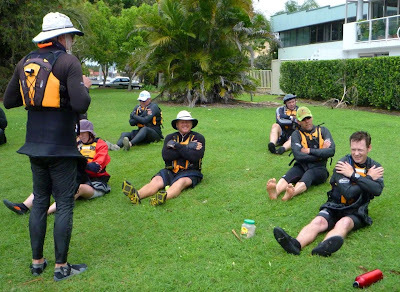 I have always enjoyed paddling with the Queensland Club, the hospitality is warm and the passion for paddling is hot even when the weather isn't. Special thanks to Gary, Eddy and Paul for a fine presentation and the invitation to come along to the show, Commodore Dredge and his team for hosting the evening and organising the training day, to Gary again for being an exemplary host and fellow instructor and, most important, to all those who attended training on Saturday for your commitment and good humour. Above: Commodore Dredge pictured admiring the new club support vessel named in his honor.